From the Me Too movement to the Incel movement, from the click-bait soundbites of Jordan Peterson to the tearful performance of Brett Kavanaugh, there is a sense in the air that masculinity is facing some sort of crisis. When in Totem and Taboo, Freud sought to offer a myth to account for the origins of society, he placed the alpha-father at the centre, wittingly or not, linking society inextricably with patriarchy. 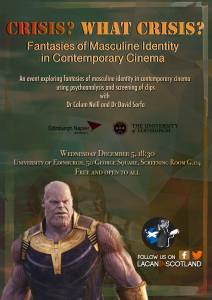 This Lacan in Scotland event will begin with a brief presentation by Calum Neill which will explore Lacan’s distillation and recuperation of Freud’s myth and the ways in which it might help us to interrogate something of what is going on in current male identity. Key to this will be the distinction between myth and fantasy. Considering the latter in terms of contemporary cinema, we will be watching clips from and discussing a selection of popular movies, including George Stevens’ Shane, James Mangold’s Logan, Xavier Legrand’s Jusqu’ à la Garde (Custody) and the Russo brothers’ Avengers: Infinity War. Following the presentation, David Sorfa will problematise and extend the ideas explored with further clips and will chair an audience led discussion. Calum Neill is Associate Professor of Psychoanalysis & Cultural Theory at Edinburgh Napier University and Director of Lacan in Scotland. David Sorfa is Senior Lecturer in Film Studies at the University of Edinburgh and Editor-in-Chief, Film-Philosophy.